The team has to make the two solids that match the information on their cards without showing each team member's information to anyone else. You will be working in a team of four. Ensure that you have plenty of cubes. 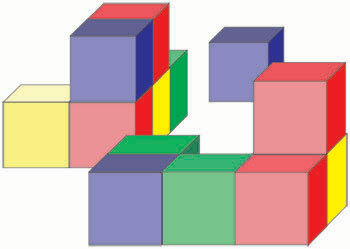 Their colour does not matter but it may be less distracting to have all the cubes of the same colour. You cannot use paper or pencil to help you because you need to listen to what others have to say. Discuss how you will work together and share your ideas. Put the 8 cards face down in the centre of the table. Each member of the team takes a card from the pile in turn (two cards each) without the others seeing what is on them. Team members cannot show their cards to anyone else on the team. A team member can describe what is on their card. Team members can ask questions to help them make sense of what is on their card, or on someone else's card. The task is complete when everyone agrees that the two solids they have made use all the information, and match everything that is on their cards. If you have an observer, they might find the following list of things to look for helpful and feed back to the team at the end of the task. Check that no one reveals their cards or writes anything down. Identify points where team members share knowledge and reasoning and listen to each other. Identify points where team members make decisions together. Note whether all members of the team are involved. Chemistry. Visualising. Non Euclidean Geometry. 2D representations of 3D shapes. Coordinates - 3D. Topology. Team-building. Cubes & cuboids. Maths Supporting SET. Nets.